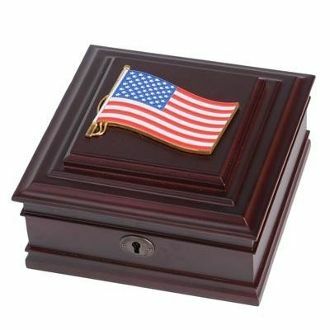 American Flag Medallion Desktop Box is made from Mahogany colored wood, and the outside dimensions measure 8-Inches by 8-Inches by 4-Inches. The desktop box features a brass lock and key, as well as a felt-lined interior and padded bottom to prevent scratches. The American Flag Medallion Desktop Box is the perfect gift for an individual who is serving, or has served in the U.S. Military, Civil Service or any other patriotic capacity. Large American Flag Medallion. Made from Cherry Colored Wood. Outside Dimensions: 8-Inch by 8-Inch by 4-Inch. Inside Dimensions: 6.5-Inches by 6.5-Inches by 2.5-Inches. Solid brass lock and key. Felt Lined Bottom. Weighs 3.5 lbs.